For the third year in succession Merewether-based aviator Matt Hall will provide the pre-fireworks entertainment over Sydney Harbour for the City of Sydney’s world renowned New Year’s Eve celebrations. Hall will fly his MXS-R in formation with team newcomer Dan O’Donnell piloting the Matt Hall Racing Extra 300L for the evening’s first display at 6pm before returning to the sky overhead the pristine harbour for a dynamic low-level solo routine at 8pm before the night’s two forework displays. It is the first time in his three years with the City of Sydney showpiece that Hall has included a formation routine and the former RAAF Fighter Combat Instructor is brimming with excitement about the night. 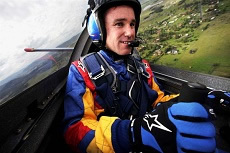 “It goes without saying that New Years Eve is my favourite event of the year because it’s not every day you fly right over the Sydney Harbour Bridge and then get to perform low level aerobatics within a stone’s throw from the Bridge, the Opera House, Fort Denison and a million people,” Hall said. The New Year’s Eve displays will close a busy 2012 for Hall and provide the perfect sequel to 2013 where he will be one of the headline acts at the Australian International Airshow at Avalon near Melbourne, release his biogrpaghy and continue to grow his burgeoning Maitland based joy flight business.